We found this a very quiet pub on a second visit. A friendly member of staff served an enjoyable Extra Stout. Interesting pictures on the walls if you have the time. The interior of this pub is only 30 years old. It was closed after WW2 and used as a timber yard until 1985 when Sam Smiths reopened it. The interior largely dates from then - the 'clock stand' separating the bar is from about 1989-90. Don't understand how people are taken in by this modern crap that all Sam Smiths pub have suffered from. "EC1, SMITHFIELD TAVERN (ex-Punch). Closed, future uncertain. 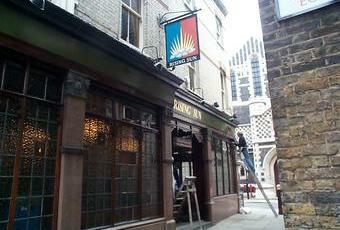 EC4, WHITE SWAN (Enterprise), 1820 Farringdon St. Closed, future uncertain." Splendidly preserved pub close to Smithfield Market. Sam Smiths' so no beer choice but, very good value for money. Another Sam Smith's museum piece in the heart of Smithfield. How do they manage to maintain and run these often empty establishments and charge half the price of surrounding pubs ? 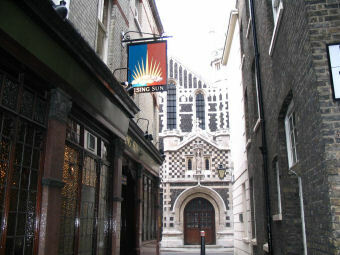 Retains the character of a proper London boozer - the Sam Smith's stout on draught was quite drinkable.